What Did the Golden Plates Look Like? A longer version of this article was originally published by the Neal A. Maxwell Institute for Religious Scholarship as “How Witnesses Described the ‘Gold Plates,’ ” Journal of Book of Mormon Studies, vol. 10, no. 1 (2001), 16-21. Joseph Smith was careful to obey the command from the Lord that he not show the plates to others. 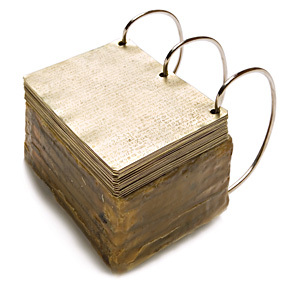 As he translated the Book of Mormon, Joseph learned that special witnesses would be called to bear testimony of the ancient record written on metal plates. He was quite relieved when he was permitted to show the plates to several witnesses. Those witnesses were then commanded to testify of their experience to others and to write their testimonies concerning the Book of Mormon. Three men, David Whitmer, Oliver Cowdery, and Martin Harris, were privileged to be shown the plates by the Angel Moroni. Then eight witnesses were shown the plates by Joseph Smith. Their testimonies are printed at the front of every copy of the Book of Mormon. Although no single comprehensive description of the Book of Mormon plates has been preserved, the Prophet Joseph Smith and several people closely associated with him made various statements that include partial descriptions of the plates. When all of the available sources are considered, quite a detailed picture emerges of the physical characteristics of the ancient Nephite record. What Were the Plates Made Of? The presumption that the plates were made of solid gold is curious but probably not correct. It was Joseph’s enemies that coined the phrase “Gold Bible.” It is more appropriate to refer to the ancient metal record as “the Golden Plates,” referring to their color, not the material they were made of. How Much Did the Plates Weigh? People of that time period were accustomed to purchasing household supplies by weight. A farmer would have a good idea of what a 60-pound bag of grain would feel like. A woman working in her kitchen would be required to lift a heavy iron kettle filled with water that may weigh up to 60 pounds. “Six inches wide by eight inches long.”5-Joseph Smith Jr. In court, testimonies that vary slightly from each other are often seen as more truthful than when they match precisely. If all the statements are exactly the same, it can indicate that the witnesses have compared notes to fabricate a story that is too perfect. The length of eight inches is given in all of these statements. Three give a width of seven inches. Memory of things like dimensions should be regarded as approximate and should not be assumed as exact. What is evident is that the page size was only slightly longer than it was wide. The plates were sealed by Moroni after he had separated from the rest of his people. He would have used materials that were readily available to him at that time. The descriptions say they were “securely bound” and “appeared solid.” The statements indicate a complete encapsulation of the plates to protect and preserve them for the future. None of the witnesses mentions metal bands around the plates. This seems to be an artistic creation of the mid-twentieth century that has no documentary basis. What Shape Were the Three Rings? How Full Were the Pages? What Was the Reading Order? “I wish to mention here that the title-page of the Book of Mormon is a literal translation, taken from the very last leaf, on the left hand side of the collection or book of plates, which contained the record which has been translated, the language of the whole running the same as all Hebrew writing in general. *” [The asterisk directs the reader to a note that says, “*That is, from right to left.”]27-Joseph Smith Jr. Does It Really Matter What the Book of Mormon Plates Looked Like? After Joseph Smith completed the translation of the Book of Mormon, the Three Witnesses and the Eight Witnesses were allowed to see and handle the plates. Their signed statements are in the front of all copies of the Book of Mormon. We have the full text of what Joseph Smith was instructed to translate. It is a message to us from the past, from a people who had the truth and then lost it. It is meant to instruct us. Seeing the plates would not necessarily motivate someone to accept the restoration of the gospel and make changes in his or her life. That motivation comes from reading and accepting the teachings of the Book of Mormon. What really matters is the spiritual witness that is promised to those who humbly seek to know the truth of these things. A true testimony of the Book of Mormon comes from reading it and, as counseled by Moroni in a promise he left to us in Moroni 10:3-5, praying about it. Look up the Neal A. Maxwell Institute at www.maxwellinstitute.byu.edu. Many critics have been quick to point out that if the record was made of solid gold it would have weighed much more than a person could lift. Besides being too heavy, thin plates of pure gold would not function well as a book. The metal would be so soft that it could easily tear from the rings, and engraving would be limited to one side. The text of the Book of Mormon itself refers to Nephi’s seeking “ore” from which to make his plates. Metal ore usually has a mixture of various metals in it. Gold and silver are often mixed together in an alloy called electrum. Logically, the Book of Mormon plates could have been composed of these two metals. Some have suggested a combination of copper and gold. The Lord promised that the plates would preserve their “brightness”(see Alma 37:5-7). Because gold does not corrode, objects made of gold can last thousands of years. When exposed to oxygen, silver tarnishes until it turns black. Copper turns a green color. Ancient American metallurgists familiar with this process were able to accelerate the oxidation of silver and copper and remove its residue, leaving an enhanced gold surface. Thus, a composite metal could be made to have the appearance of solid gold. (For details, see “How Witnesses Described the ‘Gold Plates,’ ” Journal of Book of Mormon Studies, vol. 10, no.1 , 21). This facsimile of the plates was made for an exhibit at the Museum of Church History and Art. In an attempt to be as accurate as possible, all known statements about the plates were compiled and compared. Unfortunately, there was not space in this article to include all of the descriptions. The process of making and using the model of the plates taught us more about them and led to some logical deductions. The difficulty in making the plates would encourage a scribe to be careful to fill the whole page and not waste any space. We learned how difficult it is to turn soft metal plates over loose metal rings. You have to lift each one carefully or they bind against the rings. Pliable metal changes with the pressures of movement; it becomes brittle and breaks. The holes have to be an elongated shape larger than the rings and cannot be too close to the edges or they tear out. Even though we have presented an image of what the plates may have looked like, many exact details are still lacking. For more about the making of this replica of the plates, see “A Golden Opportunity,” New Era, Feb. 2006, 34. Did Joseph Smith Write the Book of Mormon?